Blocking the ingress flood – We have moved – Follow us on www.telestehub.com! A major topic for all cable operators is the ongoing battle to maintain adequate carrier-to-noise levels in order to ensure that their downstream modulation schemes can operate error free. With the ongoing migration to better and more sophisticated modulation schemes in order to support the ever-growing capacity issues, e.g., 16 QAM to 64 QAM to 256QAM, and now talks of even 1024QAM. All these schemes require further enhanced C/N performance. Cable networks are vulnerable to interference from outside signals that damage the quality of their services. Resulting in noise and disruption of the desired signal, interference leads to poor network quality. High fault rates that are difficult and slow to rectify, slow internet browsing and loss of connection, poor interactivity and slow speed of Video On Demand services, all lead to poor customer experiences and very high costs for the operator to minimize the effects. CATV operators have invested large sums to reduce the impact of noise in the network. State-of-the-art components have been developed for the head-end, trunk, and access network that enable great connectivity and also prevent unwanted signals from degrading operators’ services. However, the Achilles’ Heel of all CATV networks is the unwanted signals generated within the subscriber’s home, which account for most of the return path noise. Open ports, unterminated flyleads, and poorly done service disconnections are very common occurrences and they are all open invitations for RF interference to enter. To make matters worse, the ongoing deployment of 4G/LTE is now leading to new ingress signals at disruptive frequencies. How to stop this rising level of noise? Using high quality products is a part of the solution, and terminating each drop correctly would solve most problems, but we know that these terminators do not always get installed and once installed, they do not always remain. • Making network quality independent of consumer behaviour. • Being able to disconnect customers without exposing the network to ingress and egress. • Blocking the ingress/egress from customer devices from entering to network from open ports, loose connectors, and unterminated flyleads. • Performing effective RF control in all frequencies between 5MHz-2400MHz and significantly improving network carrier-to-noise ratio. • Placing the solution inside customers’ homes to reduce truck rolls and solve ingress problems at their place of origin. What are the benefits of blocking ingress/egress coming from in-home networks? Free up previously unusable frequency spectrum. Reduce the impact of LTE/4G services that are being launched in the CATV band. Improve operational efficiency by reducing truck rolls. Reduce churn by decreased service disconnects and increased customer satisfaction. The BarrIER® technology is a groundbreaking, innovative integrated mechanism that operates from 5MHz-2400MHz and helps prevent ingress and egress problems. When connected, BarrIER® products perform like normal F-type or IEC connectors. 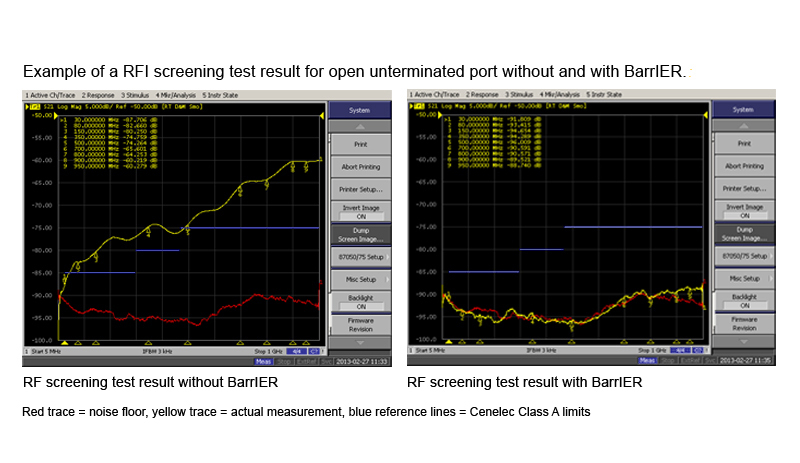 When disconnected, BarrIER® products automatically create up to 40dB of RF screening on open connectors. Their unique, patented mechanism also prevents loose connectors from occurring. In recent lab tests, the technology has been tested using a state of the art Digital Set-top box that runs an HD video transport stream DVBC 256QAM whilst transmitting a fully loaded LTE carrier (64QAM OFDMA, 20MHz bandwidth with 1200 Sub-Carriers). The first test was done on a standard, F-type male, RF flylead, one end of which was connected to a two-way splitter and the other end left unconnected. The LTE signal was increased until both pre- and post-error bit rate data was seen to corrupt the video signal. The corrupted video signal was observed with an LTE field strength of only 0.3 V/M. Using exactly the same configuration of equipment, but substituting the unconnected, standard F-type male connector with a BarrIER® F-type male connector, the flylead configuration withstood a massive 17 V/M of LTE signal field strength, without a single error in the signal transmission. Intensive testing has been done on all BarrIER® products, including tests on their ability to prevent 4G/LTE interference. The testing shows that BarrIER® technology can provide a permanent solution for the in-home ingress issues for CATV operators. The article was published in 2014 on Teleste’s website.